This is a guest post from Matt Cook, the University’s Employability Points Officer. If you haven’t signed up to the scheme, read on for reasons why you might wish to! With the Spring Term now underway, don’t forget you only have until 5pm on 18th March 2019 to claim your Employability Points for this academic year! If this is the first you have heard about Employability Points, to explain further; the Employability Points (EP) Scheme allocate points to students for completing co-curricular activities on or off campus. This can range from joining the History society (15 points) and attending workshops (5-15 points) to volunteering (10-40 points) and undertaking University roles (25-35 points). Ultimately, if it is co-curricular, you can claim points! This is a brief reminder for all Stage 1 students that the Historian’s Toolkit session this Friday will be on ‘How to get an awesome job after University’, and will be delivered by Nicola Urquhart from the Careers and Employability Service. In preparation for that session, you are strongly advised to enrol on the Careers and Employability Award on Moodle. This award is worth 60 Employability Points (if you’re signed up to the scheme – head here if you would like to join), and covers all the practical skills you will use when job-hunting, and will help you reflect on your skills and prepare a CV. 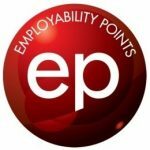 We have a guest post today from the Employability Points Scheme. If you haven’t yet signed up to the EP Scheme, read on to find out how you could get rewarded for doing all the extra-curricular things you already do to enhance your employability. Enhance your employability alongside your History Degree! In the graduate job market, it is now becoming increasingly essential to find ways to stand out from the crowd! Academic success remains imperative, but employers are increasingly looking for more and in particular, soft skills and relevant work experience. To ensure you gain both these skills and experiences, the University of Kent created the Employability Points (EP) Scheme. The University’s Employability Points scheme is designed to encourage and reward those who undertake activities which help your employability development, giving you points for these activities which can be exchanged for further employability activities, such as work experience placements and one-to-one careers advice, providing by local and national employers. Below is a guest blog from the EP team, on the opportunities available through the scheme for those interested in going into the museums and heritage sector. If you are interested in pursuing a career in Museums, Archives or another aspect of the Heritage Sector, hands on work experience is often invaluable! The Employability Points Scheme offer a diverse range of opportunities for students to undertake work experience placements and training. We are pleased to say that we have a range of rewards specifically tailored to Kent History students.